After we moved into our trailer, I wasn’t very happy with the state we found it in. After taking over 80 pictures of little nicks and scratches and dents and stains, I did not care to keep a record of the rooms as a whole. It has been 10 months since we moved in and we have had our share of frustrations with the trailer. Thankfully, there is a wonderful thing that happens to a person when they cease being a renter of a place and become an owner. (We are renting to own at the moment.) The ability to do what we would like to the trailer is very freeing! This week, while David is gone, I’ve been working hard at painting the living room. It was the nasty dark brown paneling that is common for old trailer homes. 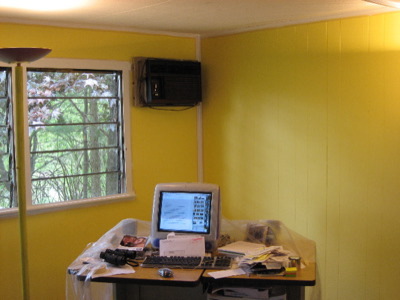 Now it is a cheery light yellow and looks more cottage-like. Here is a photo of one corner of our living room just after we moved in. The photo is highlighting the nice bumpy ceiling we have, but the dark walls are apparent also. Here is the photo of my work in progress. Hopefully tomorrow I will be done the one wall on the right and can move the plastic and put the computer desk back against the wall. My sister is coming on Saturday with her daughter and baby, I hope to have the living room neat and usable again by then. So, as I mentioned yesterday, David and I went to see Prince Caspian last night for our Anniversary. David wanted me to write a quick note to let you know, “Don’t waste your money.” He’s busy studying for his Qualifying Exam that is on Monday or he would write it himself. If you are like me, you will go anyway, just because you liked the books and want to see the movie version. Of course, like just about any movie made from books, it’s not what you hope for. “It’s a fine move as long as you are not expecting Narnia,” says David. (It’s fun quoting my husband—then I don’t have to think so hard.) “The first movie made me think of fond memories of Narnia, this movie didn’t. It’s a fun fantasy movie, and clean, but it missed the heart of the story that Lewis wrote.” David says he is still trying to figure out exactly why, and maybe he is missing the depth in the movie, but I agree with him. Narnia seems to have been lost in the movie. I did enjoy watching it, for the most part, but was sad that it strayed so far from the book. It also missed my favorite part of the book. (Small spoiler warning, skip rest of paragraph if you wish.) Prince Caspian is not my favorite of the seven books, but the part that makes it worth reading for me is when Aslan makes a Holiday with Susan and Lucy. I love the redemption and freedom that people feel when Aslan comes and heals them or frees them from not nice situations. It is not existent in the movie. No nurse to be reunited with Prince Caspian at the end either. David and I both agree that we are able to excuse a lot of the changes to the story, but when the silly pop song came on at the end of the movie, before it was done, we both groaned and felt the movie quality dropped to the bottom. Why must they ruin a movie by adding pop songs that don’t need to be there? David wants to warn you to not waste your money. I don’t feel it was a waste, exactly, and I will probably go to all the movies when they come out, because I love the books so much. But I went to “The Lion, Witch and the Wardrobe” three times and each time was able to be carried away into the land of Narnia. I won’t be doing that for this movie, that would be a waste of money to me. Maybe someday this movie will take on the “Anne of Green Gables” movie factor. The first two movies of Anne of Green Gables are so good, even if they don’t follow the books exactly. They are able to stand on their own. Maybe Prince Caspian will be able to stand on it’s own too, if you aren’t expecting the book. …. Except for that silly, frustrating pop song at the end…. Groan. Here is a link to a review that David kept talking about to me before and after the movie, from a Catholic reviewer at DecentFilms. And if you like to twist your mind around something new, dealing with the Narian series, here is an article that has spurred conversation and debate between David and I. Next week, in 6 days to be exact, is our 4th Anniversary. A wonderful 4 years it has been too! Not without it’s ups and downs, but a good, wonderful, healthy marriage. Since David will be in California on that day, we are celebrating it today. Tonight we are taking the rare luxury of going out for supper together. We are going to Joe’s Restaurant. I was hoping for a pizza buffet somewhere, for old times sake (Pizza Ranch Buffet….. Yum!) but it doesn’t look like any pizza places in town do buffets. After a yummy pizza dinner at Joe’s, David and I are going to the movies. That is also something we haven’t done much. I was about to say that we haven’t done since we moved to New York, but that isn’t true. We did see the movie Bella, and it was an excellent movie too! 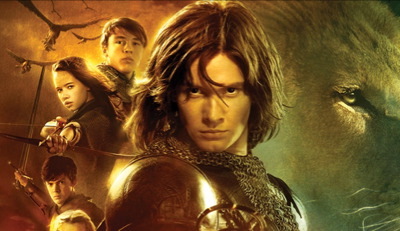 Tonight we are going to see Prince Caspian. I’m excited! Although no my favorite of the 7 books, I am looking forward to see it even so. David even bought us tickets already to be sure we would get in. What a wonderful husband! And, this morning I took a liberty simply because it is our anniversary. 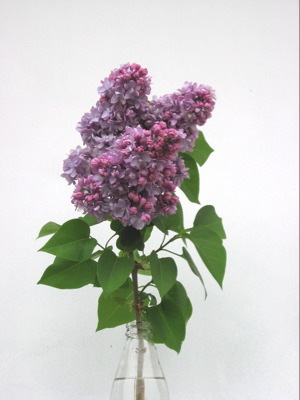 I cut myself a small bouquet of lilac flowers from the bush next door. Thankfully no one lives there, so I wasn’t stealing them. It is very satisfying to have a small bouquet of spring flowers to brighten our little trailer. So now I need to get back to studying. I’ve finished my finals for the semester, but I have a qualifying exam on Monday, and then head to California immediately for a conference. Busy busy busy! Today was a day full of surprises. Small ones mostly, but satisfying even so. This evening David and I went for a walk around the neighbourhood and I heard a bird close by that I have been hearing a lot around our home. This time I was finally able to spot it! It was a Scarlet Tanager. Another bird I have only just glimpsed at once in my life. Another “Highly Satisfying” moment. 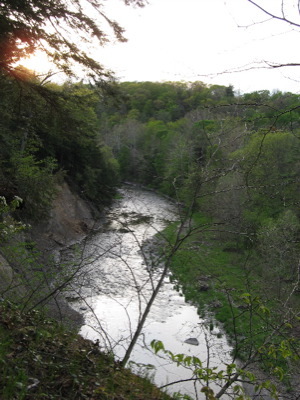 Then, while we were walking we came across a path in the woods that I thought might take us to the river. I had wanted to finish our walk by stopping at the river on the way home, so we took it. Well, after almost an hour of walking we not only saw the river, but also a great source of fiddleheads (I had just asked the neighbours this week if they knew where to pick fiddleheads, too bad it was too late in the season to pick any), hills, trees, flowers, steep hills, deer, rocks and gullies and a lot of other fun stuff. Little did we know it, but just a short walk from our trailer there is a walking trail that rivals any State park trail! And we just more or less stumbled apon it. David and I, maybe more I than David, have had an enjoyable past two months. In March Jon, David’s brother, and his girlfriend, Eryn, came to visit for their spring break. I was able to have a lot of good girl time that I haven’t had in quite some time. Shopping, talking, and more shopping and talking :) I really enjoyed it. David and Jon got a bit of their computer time in too. A week after they came my parents came for a few days after volunteering down south for the past month. They stopped by on their way up to Ontario to visit my sisters. We visited the Cornell Ornithology lab and learned a bit more about bird watching. Dad and I were particularly inspired. He bought a bird identification book, which happens to be the same one I have. Now we can compare notes easier. Two weeks after my parents left for Ontario David and I also drove up to Ontario. We flew with my sisters, brother in law and one nephew, to New Brunswick for Dad’s 60th birthday. It was just for the weekend for everyone except me, I stayed a few extra days. 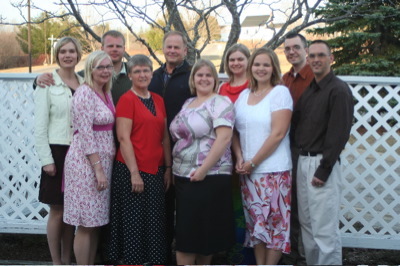 There was a big fun party for Dad at the Holiday Inn in Mactaquac. He provided a bit of entertainment from some local comedians. And us kids all said a little piece too and put on a little skit. I’ll try to get a few photos up. I was able to visit my Grammie a few times, as well as a few friends I haven’t talked to since David and I moved to the states. That was very enjoyable! Interspersed in all of this, I’ve been helping out with the local Pregnancy center in it’s Abstinence program in high schools and middle schools. It has had it’s own awards, even though it has been very tiring and some what stressful. The abstinence message is not a very popular one in most schools around here. David has been pressing on in his schooling. It’s been hard. He had two hard exams just before we left for Canada. Literally just before, I picked him up after his second exam and we drove to Canada from there. He still has a very busy month ahead too. A paper due tomorrow, which he is working on now. A contest at a conference in California in two weeks. His qualifying exam that might be the day he gets back from California, and regular exams before he leaves. We would appreciate prayers for sanity and perseverance for him. As for me and what is happening this month, I’ll write more about it later, but in short I’m looking to do a bit of painting, gardening, carving and sewing. I’ve been hit with a creativity bug and can’t wait to get started! That is what we have been up to in the past two months, and a little peak at what is happening for us in the next month. Lord willing life will slow down for the summer for David. He will be working on his research but won’t have to worry about classes.